This article is about the rapid transit station in Shenzhen. For the Hong Kong MTR interchange across the border, see Lok Ma Chau station. 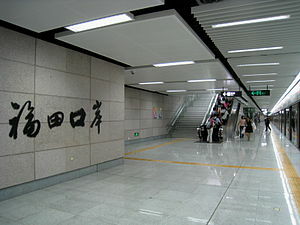 Futian Checkpoint station (Chinese: 福田口岸站; pinyin: Fútián Kǒu'àn zhàn; Jyutping: fuk1 tin4 hau2 on6 zaam6) is a terminus of Line 4 of the Shenzhen Metro. It opened on 28 June 2007. It is located at the ground level of Futian Port Control Point in Futian District, Shenzhen, People's Republic of China, and it is the only ground station in Shenzhen Metro. Futian Port Control Point and Futian Checkpoint Station are connected to Hong Kong's Lok Ma Chau station by a footbridge. 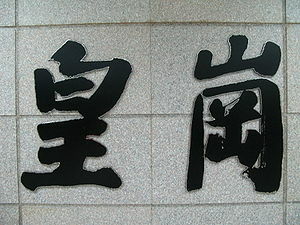 The station was called Huanggang (皇岗; Huánggǎng; wong4 gong1) because of its location near Huanggang, which is also an immigration control point between Shenzhen and Hong Kong. It was renamed to Futiankouan on 15 August 2008 to avoid confusion between Futian Port and Huanggang Port. "Kouan" (口岸) means a (immigration) port. Starting from 1 July 2010, with MTR Corporation (Shenzhen) taking over the operations and management of Line 4, the English name Futian Checkpoint is now used. A station called Huanggang Checkpoint opened at Huanggang Port in 2016. There are a total of 4 levels in Futian Checkpoint station. The 2nd and 3rd levels (above ground) are immigration facilities (being the arrivals hall and departures hall respectively), while the 1st level is the station concourse. The 2 side platforms and an island platform is located on the lowest level (ground floor), but only one island platform and 1 side platform is used in daily operations. Among them, the side platform serves as the unloading platform for trains arriving at the station, while the other island platform is used as the boarding platform for trains departing the station. This method is called the Spanish solution. The station has 2 exits. In addition, the station is located in the Futian Port Control Point building, and passengers may proceed to MTR Lok Ma Chau station in Hong Kong after undergoing immigration procedures. 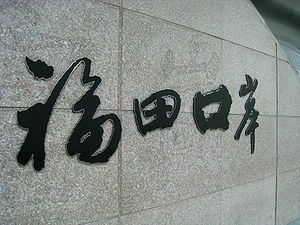 Wikimedia Commons has media related to Futian Checkpoint Station. Stations that are proposed, under planning or under construction are shown in gray and italics. English names of these stations are not yet confirmed. This page was last edited on 29 January 2019, at 07:55 (UTC).